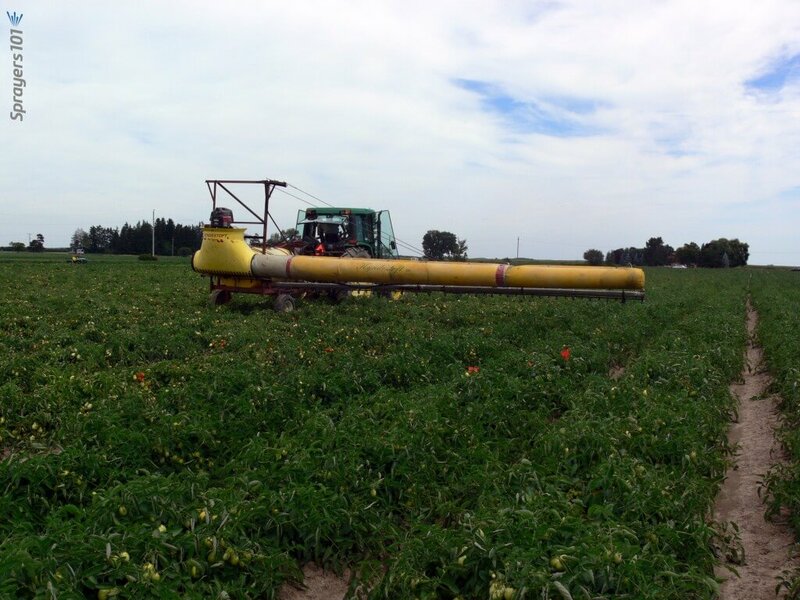 Spraying field tomato is difficult – period. In Ontario, early variety tomato canopies get very dense in July. The inner canopy is relatively still, humid, cool and a perfect environment for diseases such as late blight. It is challenging to deliver fungicides to the inner canopy and this can lead to inadequate disease control. Matters are slightly improved as the fruit grows and pulls the canopy open, and staked tomatoes might allow for the use of directed sprays, such as drop arms in staked peppers. But, there’s no getting around it – from a droplet’s perspective, it’s tough to get through the outer canopy. Imagine you are a spray droplet trying to get inside this canopy. 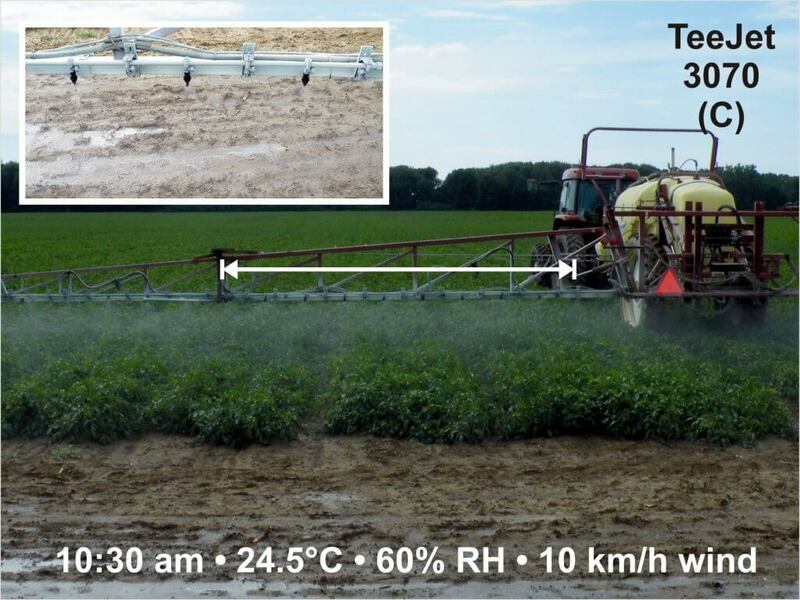 In August, 2011 we worked in a market garden operation in Bolton comparing the spray coverage from four different nozzle configurations. 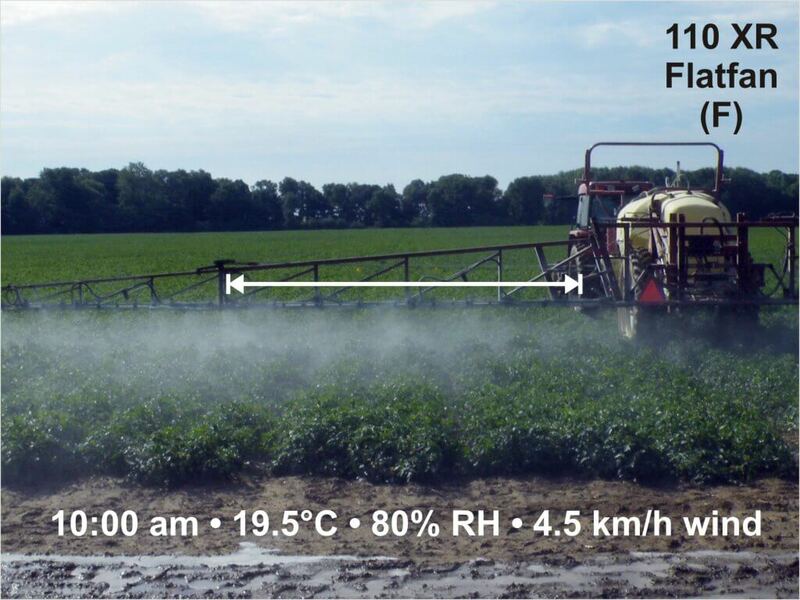 We used the growers typical spray parameters: a travel speed of 4.5 km/h (2.8 mph), an operating pressure of about 4 bar (60 psi), a boom height of 45 cm (18 in) above the ground, and a sprayer output of 550 L/ha (~60 gpa). 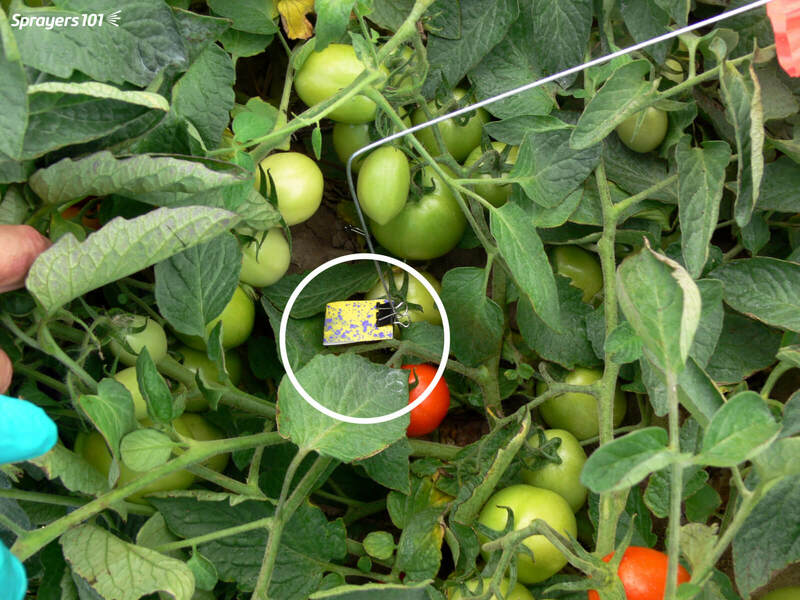 To monitor spray coverage, water sensitive paper was placed face-up in the middle of the tomato canopy. 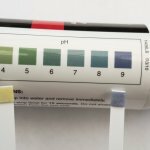 This diagnostic tool turns from yellow to blue when contacted by spray. 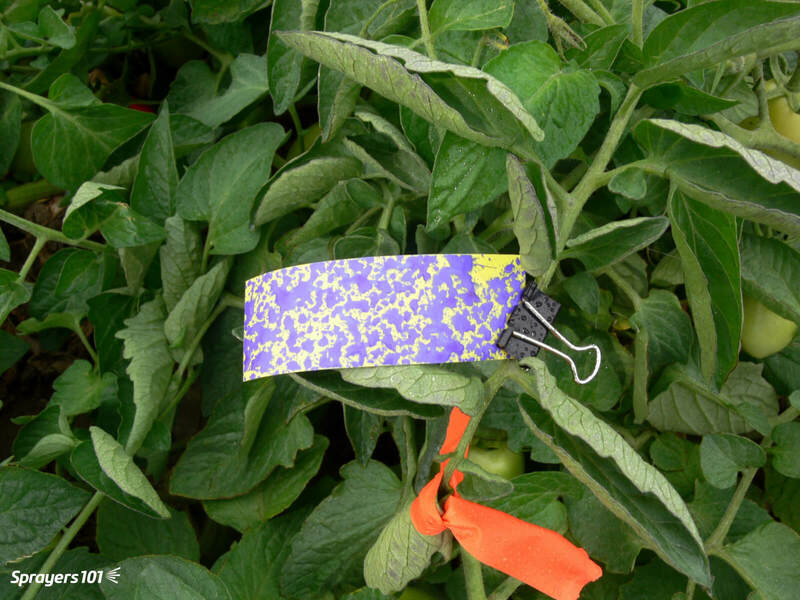 Water-sensitive paper at top of tomato canopy – easy to hit. They part the outer canopy giving spray access to the inner canopy. They rustle leaves to expose all surfaces to spray. They permit the use of smaller droplets, which are more numerous and adhere to vertical surfaces, by entraining them and reducing drift. 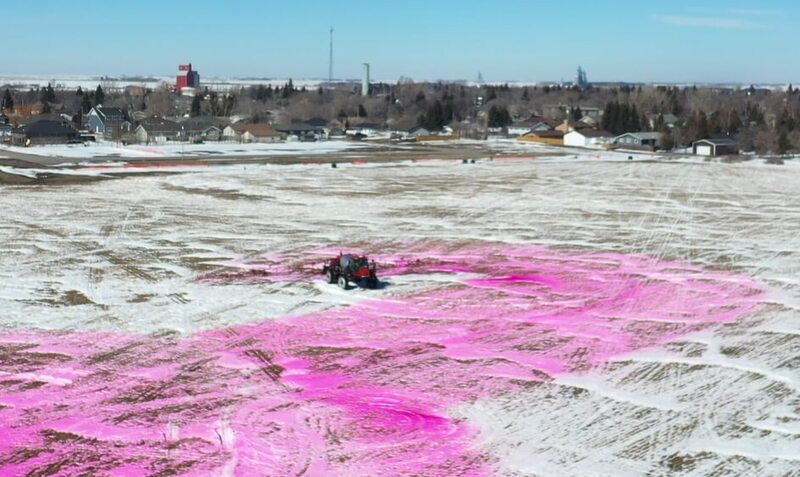 They extend the spray window by permitting the applicator to operate in slightly higher ambient wind speeds. Boom sprayer with air assist sleeve operating. The air induction nozzles performed poorly. Their Coarse/Very Coarse droplets impacted on the outer canopy, created run-off and resulted in very little canopy penetration. Medium droplets produced by twin fans and conventional flat fans were both inconsistent with inner-canopy coverage, but some advantage may have been observed with air assist. The TwinJets contributed to higher drift (likely because they were too high off the canopy) but otherwise produced coverage similar to the conventional flat fans. From these observations, the convention that spray shape (e.g. cone, fan, twin) has little or no impact on broadleaf canopy penetration holds true. Acceptable spray coverage deep in canopy (harder to hit) using hollow cone nozzles and air assist. After inspecting the papers deep in the canopy, we were surprised that air assist did not obviously improve canopy penetration. It did seem to help, but it wasn’t a slam-dunk. 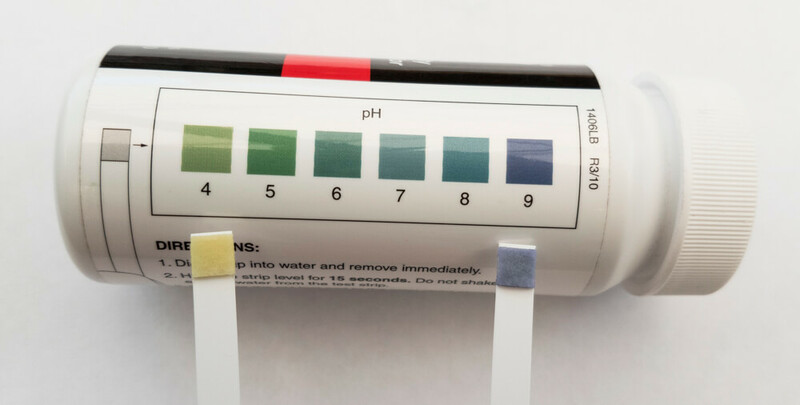 This may be because finer droplets (<50µm) are not easily seen on water sensitive paper. It might also be because we did not calibrate the air speed to the canopy: too little air and spray impacts on the outer canopy, while too much air forces leaves out of the way and spray is blown into the ground. It was obvious that drift was greatly reduced, so logically the spray had to have gone somewhere – we can only assume it entered the canopy. The best results were achieved with hollow cones and air assist. 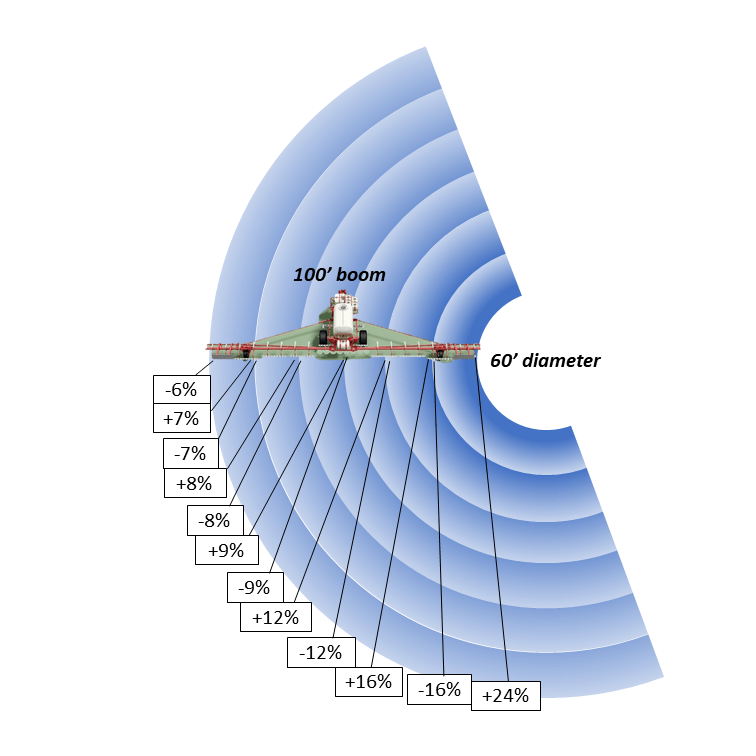 Theoretically, smaller droplets should improve the potential for coverage by sheer number, but they slow quickly and are easily blown off course. Winds were only about 5 km/h (3 mph) during the trials. Had they been higher, the no-air-assist condition would have resulted in poorer canopy coverage. 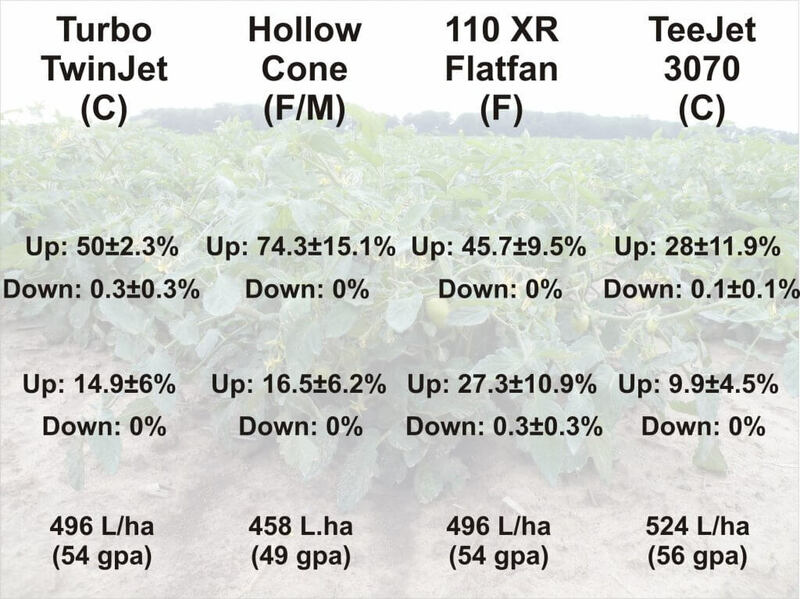 While we feel the air assist improved inner canopy coverage, we attribute much of the performance to the spray volume of 750 L/ha (80 gpa), which was significantly higher than we used with the other nozzles. When we attempted lower volumes using the hollow cones (not shown) the inner canopy coverage was greatly compromised. Higher volumes are a demonstrated means for improving canopy penetration, so this observation is consistent with what was expected. 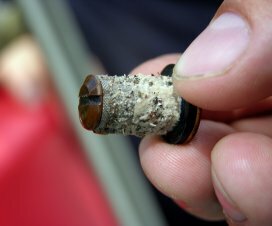 The 2011 trial suggested that hollow cone tips used with high volume and air assist, improved canopy coverage and penetration. They are, however, very prone to drift and their use is not recommended without an air assist sleeve to counter the spray drift. Spray volumes over 500 L/ha are highly recommended. In July, 2016 we ran another study in Chatham-Kent. 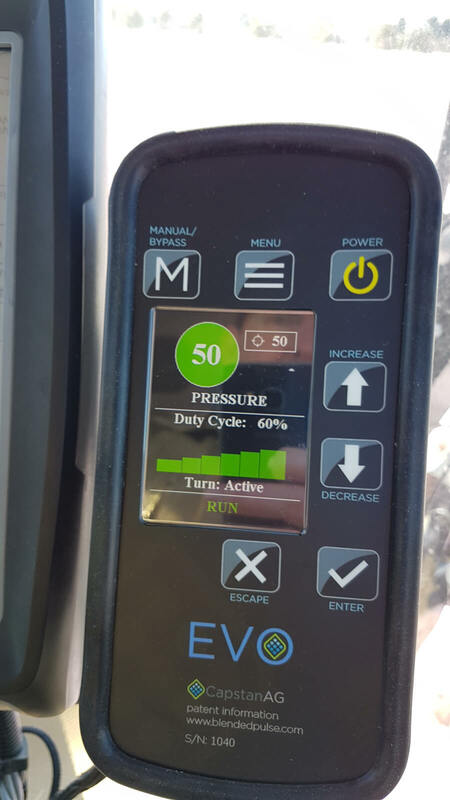 This operation was concerned about spray drift and recently changed from Hardi hollow cones on 25 cm (10″) centres to TeeJet Turbo TwinJets on 50 cm (20″) centres. They wanted to know if they had improved their coverage. We decided to test four nozzles at similar driving speeds and volumes. Once again, we used water-sensitive paper. This time we placed two pieces back-to-back (face up and face down) about 1/3 down into the canopy. Then we placed two more in the same orientation about 2/3 down into the canopy. We did this for three plants for each pass. 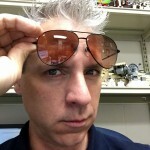 The next four images show the visual drift and weather conditions for each nozzle. Note that only one boom section was nozzled (indicated by a white line) in each condition. It was very humid, making it difficult to place and retrieve the papers without smearing them. This made it tricky to discern differences in coverage, and the blurring prevented us from quantifying droplet density (i.e. number of drops per unit area). Nevertheless, papers were scanned and the percent coverage was calculated using the DepositScan software developed by the USDA’s Dr. Heping Zhu. 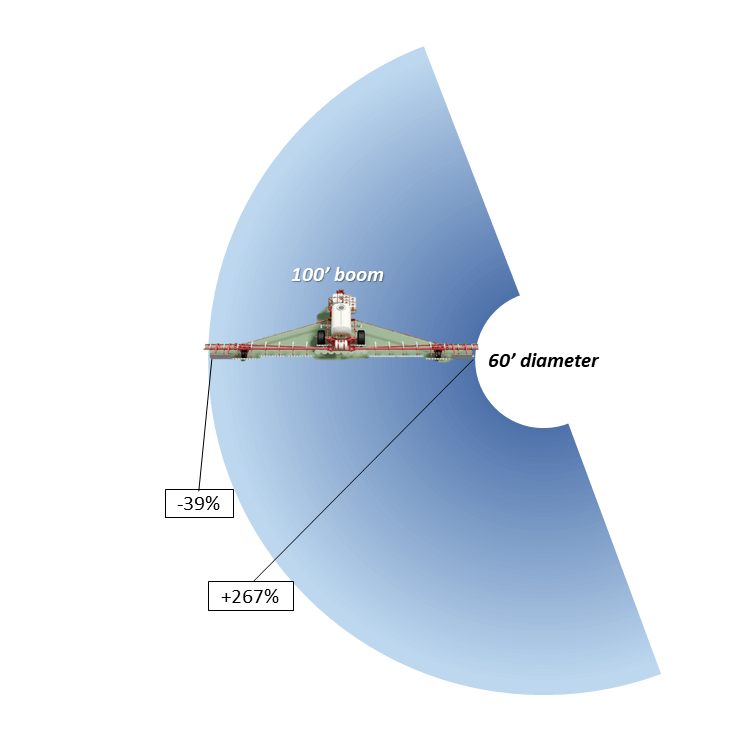 The average percent-coverage (± S.E. n=3) is shown in the image below. Coverage on the upward-facing papers in the upper portion of the canopy showed excessive coverage for all nozzles but the 3070. Little or no coverage was detected on the downward-facing cards, but without air-assist or a directed application (e.g. drop arms), this was expected. It’s the deeper canopy that’s of particular interest. The only significant difference may lie in the XR flat fan which showed more coverage on the upward facing papers and some (however little) on the downward facing papers. This came as something of a surprise given that the XR produced a Fine spray quality and there was no air assist to guide spray into the canopy. I believe the high humidity and low winds played a role in this outcome by reducing evaporation and off-target drift. On a drier, windier day, we likely would not have seen this level of inner canopy coverage for either the XR or the hollow cone. 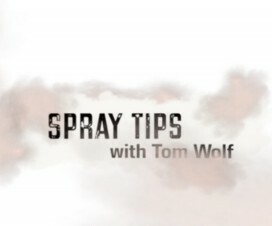 By comparison, the Turbo TwinJet with its Coarse spray quality not only reduces off target drift, but would be more resilient in drier and windier weather and may very well have produced the best coverage by comparison. 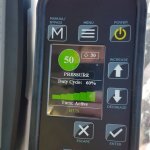 Properly calibrated air assist will reduce drift and has promise to improve canopy penetration/coverage. Spray shape (e.g. 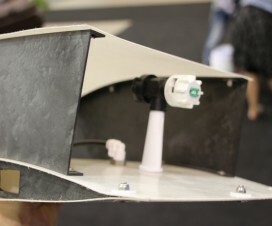 twin, hollow cone, flat fan) does not seem to play a role in canopy penetration. 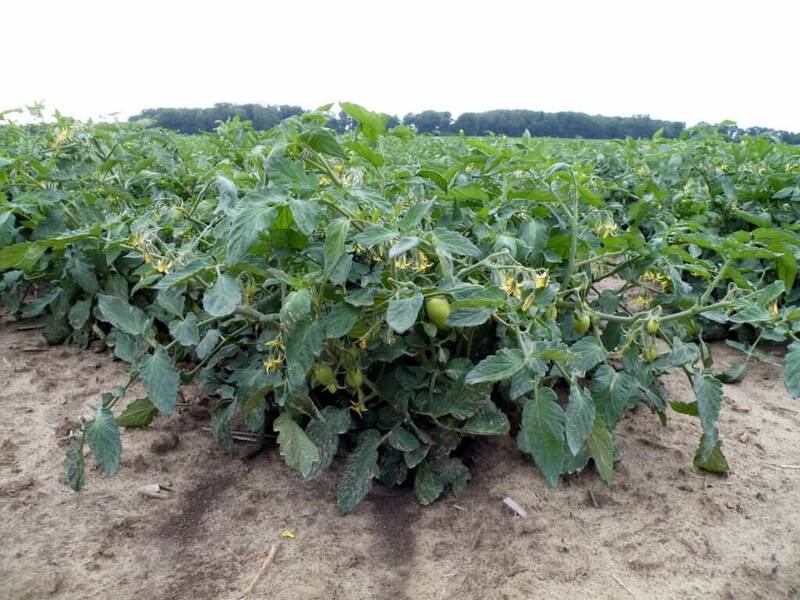 Spray quality larger than Coarse may negatively impact canopy penetration in tomato. 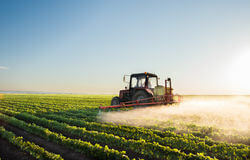 Coarse spray quality is perhaps the most versatile option when volume is sufficient (>500 L/ha). 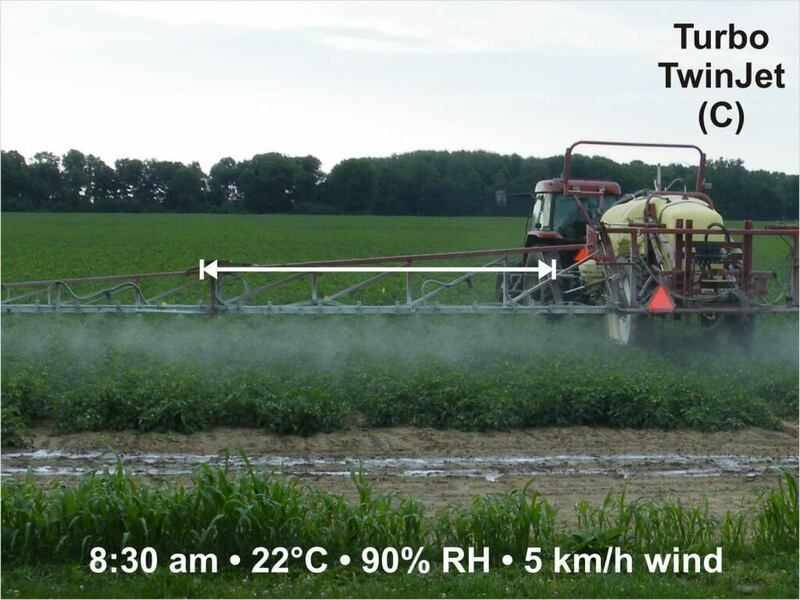 Fine spray quality is only a viable option in high humidity and light winds. 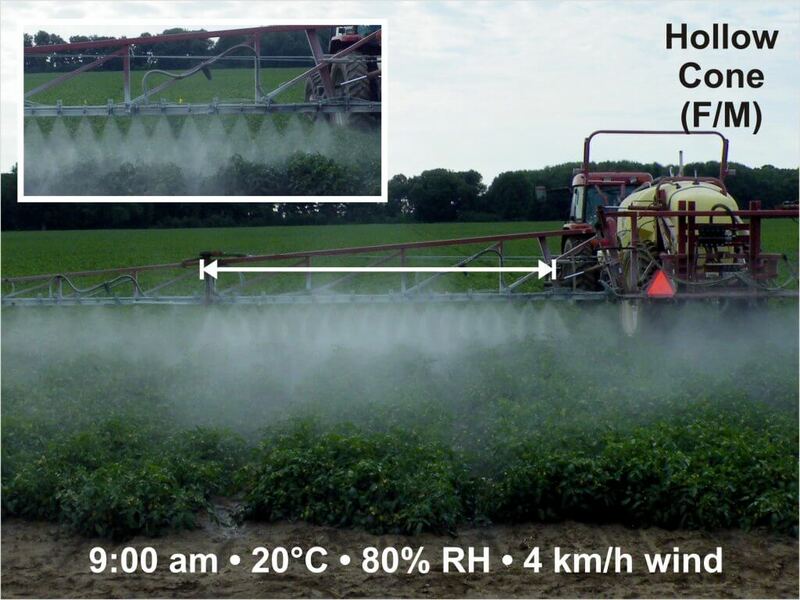 However, air assist is critical to counter drift and high spray volumes (>500 L/ha) are a must. Underleaf coverage is exceedingly difficult to achieve, even with Finer spray quality and air assist.